The Wisconsin Swiss Traditional Music Project identified, documented, and recorded a broad sampling of Wisconsin Swiss traditional music, mostly in Green and Dane counties, during 1987-1988. Managed by Project Director Phil Martin, the resulting audiocassette release, Swissconsin: My Homeland, features contemporary and historical studio recordings and portrays primarily the highly proficient, public-oriented performance style often heard in community-produced concerts, recordings, and festivals. The publication Yodeling in Dairyland: A History of Swiss Music in Wisconsin also emerged from the survey in 1991. The collection includes folklorist James P. Leary's interview sound recordings with five Swiss-American musicians, notes from interviews with three more, and selected research materials; Lewis Koch's photography; and Wisconsin Folk Museum project and production files. Phil Martin began the Wisconsin Swiss Traditional Music Project under his research organization, the Wisconsin Folklife Center, which was then based at Folklore Village Farm in Dodgeville where he was Vice-President of the Board of Directors. By the end of the project, Martin had folded the Center into a new non-profit, the Wisconsin Folk Museum, where he was Executive Director. The new Folklife Center grew from Martin's Old-Time Traditional Music in Wisconsin research and productions. After featuring traditional Norwegian-American and German-American musical traditions in the Folklife Center's “Ethnic Music Series,” Martin turned to Wisconsin's Swiss-American musical traditions. He focused the new project especially on Green County, home to a concentration of Swiss emigrants mostly from the mountainous cantons of Glarus and Bern. The 1986-1988 field and studio recordings made for the project emphasized the public-oriented performance style often heard in community-produced concerts, recordings, and festivals. Assisted by Rudy Burkhalter, a well known Swiss-American musician, the researchers contacted area musicians and arranged recording sessions and interviews. Leary formally interviewed eight Swiss-American musicians: Rudy Burkhalter, Leo and Anna Gempler, Roger Bright, and Al Mueller with sound recordings, and Martha Bernet, Betty Vetterli, and Trudy Brandli with handwritten notes. The interviews focused on personal and family history, musical selections that were recorded, and the role of music in south-central Wisconsin tradition. Lewis Koch photographed the performers, their home interiors, historic personal photos, and farm and town landscapes in the area. Leary also located historic musical recordings of Swiss-American and European-Swiss artists from the Upper Midwest region and across the country. The resulting cassette production, Swissconsin: My Homeland, published in 1988 by the Wisconsin Folklife Center, included accordion and alphorn playing, yodeling and choral singing, and alpine-style dance bands. Contemporary recordings of Rudy Burkhalter, Martha Bernet, Anna Gempler, Bob and Scott Lorenz, Alfred and Martha Stucki, Betty Vetterli, the Edelweiss Stars, the Monroe Swiss Singers, and the New Glarus Alphorn Trio, were interspersed with historic reissues of recordings by influential Swiss and Swiss-American performers (Rudy Burkhalter, Louis Alder and his Mountaineers, the Moser Brothers, and the Swiss Family Frauenfelder). Subsequently, in 1991 the Folk Museum published James P. Leary's related Yodeling in Dairyland: A History of Swiss Music in Wisconsin. One essay in the book provides an overview of Swiss music in Wisconsin, the other focuses on Rudy Burkhalter, an influential performer whose varied career, in the Old World and the New, epitomizes the Swiss-American musical experience. Swissconsin was included in the American Folklife Center's American Folk Music and Folklore Recordings 1988: A Selected List (Washington, DC: Library of Congress). In 2004, the Center for the Study of Upper Midwestern Cultures re-released Swissconsin in CD format. Martin obtained National Endowment for the Arts (Folk Arts) funding for the project, with Folklore Village Farm as the sponsoring non-profit organization, and the University of Wisconsin-Madison Folklore Program contributed to production costs. Under the Wisconsin Folk Museum, Martin applied grants to the project from the Webcrafters-Frautschi Foundation, the Wisconsin Arts Board, and the Dane County Cultural Affairs Commission. The “Wisconsin Folk Museum Records” (call number M98-044) at the Wisconsin Historical Society Library-Archives Division contain 12 artist files related to the Swiss project, formerly maintained by the Wisconsin Folk Museum. These files include tape indexes, field notes, flyers, copies of newspaper articles, letters, and some release forms. There are three folders at the UW-Madison Folklore Program. The first, the official NEA grant file, contains original NEA grant proposals, a copy of the final report to NEA, official grant correspondence from and to NEA and UW-Madison, as well as handwritten budget accounting notes. A second contains invoices, correspondence, the audiocassette insert, and handwritten notes detailing the production of Swissconsin. A third file for Yodeling in Dairyland contains invoices, newspaper clippings, and a listing of Swiss photographs, a description of the photographs and an indication of who provided them, and a copy of the publication. Negatives and contact sheets in Folklore Program custody were made primarily in Monroe and New Glarus and are images of buildings, dancing, people in ethnic dress, and historical photographs. In his personal collection, Jim Leary has six audiocassettes and four folders related to the project. The audiocassettes contain Swiss music and interviews with Swiss musicians by Leary. The “Swiss Project: Sources” folder contains Leary's background research materials--brochures, bibliographies, reference material, newspapers, letters, and handwritten notes--on the history of Swiss music in the United States and Wisconsin. The correspondence folder includes correspondence with other scholars on the topic of Swiss music. Chief correspondents are Brigitte Bachmann-Geiser of the Swiss Museum and Institute for Folkmusic and Musical Instruments, Bern, Switzerland and folklorist Regina Bendix, then of Lewis and Clark College, Portland, Oregon. The “Various Artists” folder contains a range of items including newspaper clippings; biographical notes on artists, including Martha Bernet, Betty Vetterli, Trudy Brandli and the Monroe Swiss Singers; and sound recording logs by Leary on the interviews with Rudy Burkhalter, Roger Bright, Leo and Anna Gempler, and Albert Mueller. Typed versions of the sound recording logs, in paper and on a computer diskette, completed by student assistant Jocelyne Bodden, are in the fourth folder. Philip N. Martin initiated, directed, and obtained funding for the Wisconsin Swiss Traditional Music Project. Martin enlisted folklorist James P. Leary to interview contemporary Swiss-American musicians and obtain permissions for some reproductions of early commercial recordings, and he hired photographer Lewis Koch to provide photo documentation for the project. Martin selected the musical numbers and produced the master sound recordings for the Swissconsin: My Homeland audiocassette at Marv Nonn's studio outside of Cross Plains, Wisconsin, where the master recordings remain. Martin also wrote the production's liner notes, and Koch designed the insert. Martin later edited and published Leary's related Yodeling in Dairyland: A History of Swiss Music in Wisconsin (1991) through the Wisconsin Folk Museum, and authored the final report to the National Endowment for the Arts, on which portions of this guide are based. Contact individual repositories for access information. Consult institutional repositories for specific information on use restrictions. Review of the materials held by James P. Leary and the UW-Madison Folklore Program for non-profit personal, educational, and research purposes may be arranged. Duplication for public presentation, publication, and production requires negotiation with Leary and the people documented or their representatives. Project documentation and Swissconsin, created under the Wisconsin Folklife Center, then associated with Folklore Village Farm, was subsumed by the Wisconsin Folk Museum, which attained official 501(c)3 non-profit status in 1988. Yodeling in Dairyland was published by the Museum in 1991. When the Folk Museum closed in 1995-1996, materials in the Museum's archives transferred to Mills Music Library and the Wisconsin Historical Society, while the University of Wisconsin-Folklore Program acquired remaining copies of productions and rights to productions and sales of both Swissconsin and Yodeling. The 2004 CD reissue of Swissconsin was published by UW-Madison's Center for the Study of Upper Midwestern Cultures. James P. Leary has retained his original research and documentary materials listed here. Please consult repositories for guidelines. We suggest the following citation form when using direct quotes from a person documented: [Name of person documented]. [Date]. [Tape/video/other]-recorded interview by [Fieldworker name]. [Place interviewed]. [Name of collection/project]. [Repository, city, state]. When using a specific image: [Identify subject matter/people in caption]. Photo/image by [Photographer/fieldworker name]. [Date]. Courtesy of [repository]. To quote fieldworker, follow bibliographical style. 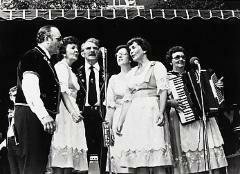 The Edelweiss and Betty group (Clayton Streiff, Kathleen Zentner Elmer, Ernst Zentner, Marion Zentner Streiff, Martha Bernet, and Betty Vetterli) performs for Cheese Days crowds over Monroe, Wisconsin's WEKZ radio, 1980. Copy photograph by Lewis Koch, 1988.